The Planet Waves Cable Cutter/Tester is the fast and easy helper in constructing your instrument and audio cables. 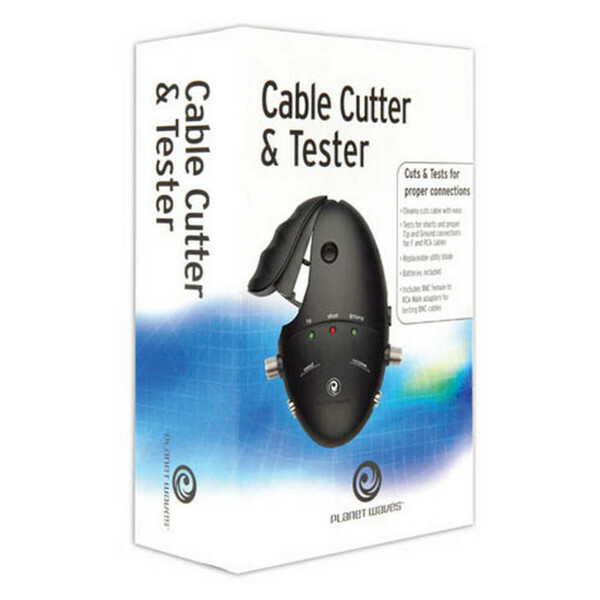 Designed to work with Planet Waves Cable Station cable and plugs, the unit not only cuts cable with ease and accuracy, but also tests for shorts and proper tip and ground connections for 1/4" and RCA cables. Planet Waves Cable Station allows musicians to make their own custom-length instrument cable without the hassle and inconvenience of soldering. The cables are made by pushing the Planet Waves plugs firmly onto the Cable Station cable and tightening a screw on the side of the plug. Cable Station cable is marked every foot for quick and precise measuring. A variety of plug styles enable virtually limitless options: pedalboards, effects racks, DJ cases, studio applications, etc.